The SRISA Gallery of Contemporary Art hosts a number of artist exhibits throughout the year. The Gallery welcomes Artist Adalberto Abbate and his exhibit Firenze Says, curated by Pietro Gaglianò. The artist incorporates the themes of civil liberties in his graffiti style work. Opening reception January 25, 2012 from 7-9pm. The exhibit will remain on display at the SRISA Gallery of Contemporary Art until March 2, 2012. The Gallery welcomes Artist Michael Loderstedt and his exhibition Utopia Revisited, from November 10, 2011 to December 6, 2011. In the exhibition, the artist presents several overlapping and interconnected narrative structures revealed through screenprinted, cut and folder paper houses and birds. The houses, modeled after actual addresses in the “Garden City” of Hellerau, Germany, borrow scaled-down details from the actual houses, and impart the interiors with a profusion of colorful imagery taken from his own garden in Cleveland. The paper birds, modeled from the magpie – a common bird in Europe – add another layer to the narrative. The SRISA Gallery of Contemporary Art opened the the Fall season with a performance by French artist Anthony Chretien and Swiss artist/musician Guy Bettini. The duo performance captured the impressive physical act of drawing with an elaborated sound recording of Chretien’s charcoal drawing. This improvised drawing was created in front of an audience of spectators, art fans, and SRISA students, and accompanied by a work in sound by Bettini that is improvised and elaborated in conjunction with the drawing. The performance was followed by a talk given by Swiss philosopher Raffaele Scolari entitled ”il ritorno del traccio”. The installation documenting the performance along with works by Bettini will be visible in both the main entrance space and gallery. 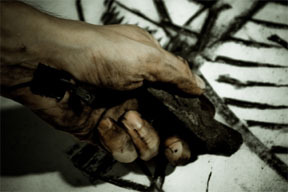 From July 7 to August 2, 2011, the Gallery is showcasing Macro-Micro: Works by Michael McCarthy and Gloria Marco Munuera. The artists experiment with non-traditional photographic processes to highlight and abstract the natural world. The life-sized apocalyptic portraits by Michael appear to float on the walls of the gallery. Gloria’s photographs, on closer inspection, highlight the floating image of an astronaut. The Painting and Drawing Program offers students the opportunity to focus on both the formal and intellectual aspects of art making. Formal guidelines for 2-dimensional art, many of which were first articulated during the Renaissance, provide the basis on which drawing and painting classes are taught. Equal emphasis is placed on contemporary art issues and ideas which challenge students to find their own artistic voice. As Santa Reparata generally has a variety of students with various levels of art experience, classes are based on individualized instruction. This is combined with group discussions, use of a wide variety of visual examples, reading assignments, guest speakers and visits to gallery and museum shows. Professor Andrew Smaldone leads onsite classes such as the Tour of the Last Supper. Photography courses at SRISA offer opportunities for both beginning and advanced students to explore the city of Florence through the medium of photography. The SRISA Printmaking Department offers one of the best-equipped and most broad-ranging print facilities in Italy. Students have a full range of technical possibilities, including Relief Printing, Etching, Stone Lithography, Photo-mechanical Processes, Oil and Water-based Mono-printing, Letterpress, Bookbinding, Papermaking, and Digital Technology. The Book Arts course introduces students to the traditions and methods of the handmade book, as well as the expressive possibilities available with book making.